This Wine Tasting Guide by Rose Murray Brown is about two things – the wine and having fun. Rose is one of a small number of international Masters of Wine and has regular wine tasting events in Edinburgh. Fancy learning how to put words to wine? It might all sound a bit daunting, but wine tasting is not just for those with supersized noses or a palate full of special taste buds. 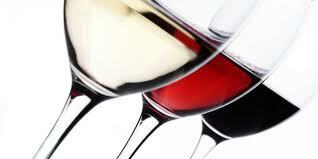 If you think you can tell the difference between good food and bad food – you will be able to do the same for wine. Tasting wine is similar to drinking, but you just have to slow down your reactions and concentrate a bit more on what is in front of you. We don’t learn to ‘smell’ at school, we just pick it up as we go along and it all comes quite naturally. The hardest bit is describing the wine – the easiest bit is enjoying it! Firstly choose a clear glass, tapered at the top to catch aromas. Coloured or cut glass are unsuitable, as you can’t see the wine properly. Pour yourself a sample (one third full) into the glass. Tilt it against a white background, so that you can see the colour gradation from the wine’s rim to centre – and check it is clear and bright. Try to describe the colour. If it’s a white wine, is it light white with a greeny tinge? It is likely to be a youthful crisp & unoaked wine, whilst a deep gold indicates an older, sweeter or oaky white. If it’s a red, it will vary from light ruby (thin-skinned Pinot Noir grape) to dark red (thick-skinned Cabernet Sauvignon grape) – and a tawny rim indicates age. Phew – done it. Now that was easy! Now try to write down what you have smelt and tasted. Finding it tricky? Come along to one of my wine tasting evenings – or if you love good food too – a food and wine matching dinner. A great chance to learn more about swirling and sniffing – and how to pick a winner from the wine shelf with someone to guide you along in a fun interactive atmosphere with visuals of beautiful vineyards to inspire you. It is also a great way of meeting new friends. See you there.